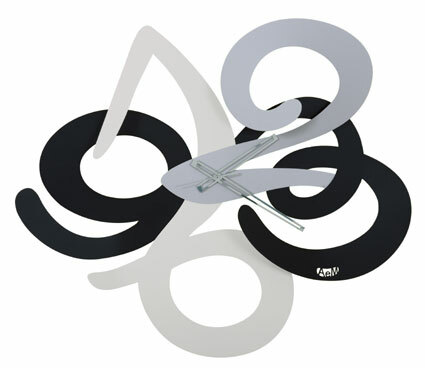 A funky and stunning design Italian clock. Three eye catching swirls, in black, silver/grey and white interlock together to form the 3,6,9 and 12 numbers - a real statement piece for any room. The clock is not flat as some parts come AWAY from the wall!! A great sized 62cm high and 66cm wide. Requires 1 AA battery (not included).